PLATTSBURGH — The first piece of the region’s manufacturing future has arrived. 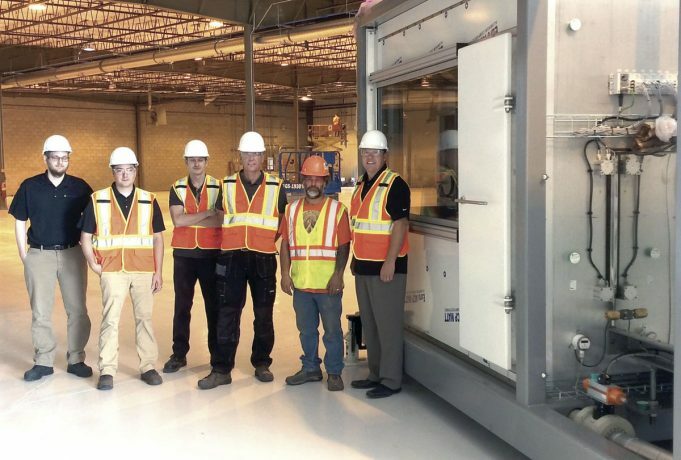 Norsk Titanium Senior Vice President of Operations Chris Bohlmann said that MERKE IV Rapid Plasma Deposition unit was delivered in Plattsburgh Monday night. The machine and associated equipment came in two shipments, with installation underway Tuesday. The work is taking place at the new Norsk Titanium Plattsburgh Demonstration and Qualification Center in Air Industrial Park in Plattsburgh. Installation is expected to take several weeks, he said. Bohlmann said the new center is expected to be operational by the end of 2016. It will eventually include several of the company’s proprietary 3D printing machines, but also equipment to support specification qualification of the titanium aerospace components produced, such as heat treating and machining. “This is a facility Norsk Titanium is investing in for the purposes of demonstration and rapid qualification,” he said. “It will be a place we can begin to train the workforce we need and allows us to get a jump start before we get into the production facility. The various pieces of equipment will be part of Norsk’s “ultra-lean cell,’ a production line that converts electronic blueprints into finished aerospace parts in approximately 120 feet. That allows Norsk to make components much more rapidly than traditional forging and machining, a process that often takes months. “We can make these components in a matter of hours or days,” Bohlmann said. The process also drastically reduces the amount of scrap created in the machining and finishing processes, as rapid plasma deposition results in pieces that are much closer to their finished shape, he said. The potential time and cost reduction has attracted interest from a number of aerospace firms, as well as investors and suppliers. While the machine and the others to follow were purchased by New York state, the remainder of the Qualification Center equipment and renovations are solely a Norsk Titanium investment. “We are already investing heavily in the community,” Bohlmann said. The main purpose of this facility is for demonstration of the process and qualification of components that will be produced starting in 2017. It will offer a chance to showcase the Norsk technology and capabilities without the need to travel to Norway. Norsk does need ISO AS 9100 certification for the new facility, including its equipment and processes — aerospace companies require suppliers to have that rating, Bohlmann said. The company is already on Boeing’s qualified producer list for parts produced in Norway. The Plattsburgh center would be added once it is ISO certified. That will allow them to move forward with their certification needs and not be tied to the construction timetable of the production facility, Bohlmann said. A couple more machines are scheduled to arrive early next year, he said. The company had previously announced the center would have up to 10 MERKE IV machines. “The facility is large enough for us to satisfy production needs in the future if that’s what’s required,” Bohlmann said. The 67,000-square-foot Qualification Center building on Martina Circle is under lease from the Development Corp.
“I can’t say enough about how they have helped us with this process,” Bohlmann said. Local contractors and subcontractors are handling the bulk of the work there, including Luck Builders/Luck Brothers, Ace Electric, Hogan Refrigeration, Raville Painting and Architectural Engineering and Design Associates. “These are all local companies,” he said. The community has supported the project from the beginning, he said. It started with the North Country Chamber of Commerce, which brought the site to their attention and later set them up with vendors for services and workforce development programs. Bohlmann said they have already identified a number of well-qualified employees. They have hired more than 10 so far, including some who are training in Norway to be able to operate this first machine in Plattsburgh. The efforts to install the equipment in the new center will help the Norsk team gain proficiency as they prepare for the production facility, which is expected to be built next year. “When you add all of that together, I think there’s going to be a very seamless and efficient startup,” he said.